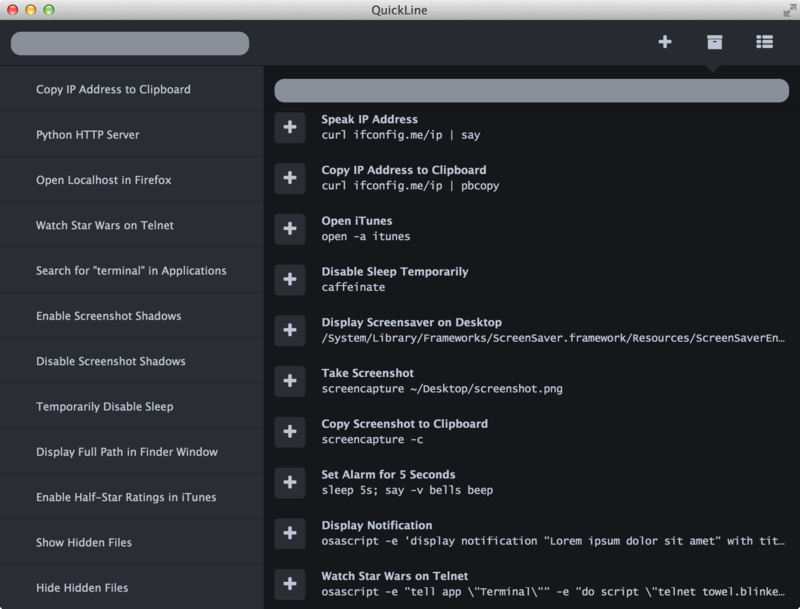 You can also view the status and output of your commands using the built-in console. Finally, you can discover and import commands from the included library, and modify them to suit your needs. I’ve collected a bunch of commands to access hidden features, configure your system, and speed up repetitive tasks. For the mother of all lists, check out Awesome OS X Command Line. Part of the motivation for this app was the simple utility of being able to “bookmark” commonly used, but verbose, terminal commands. At the same time, I wanted to put within reach the power of the command line to people who aren’t necessarily power users. At least give them a toehold so they aren’t put off and might eventually discover the joys of grepping and vimming and piping. As with my other projects like Snowball and Bootswatch, the goal was to find the sweet spot between beginner and expert. QuickLine bridges apps like TinkerTool that are easy to use but limited by what their developers design for, and Terminal, a magical cauldron that requires mysterious incantations. 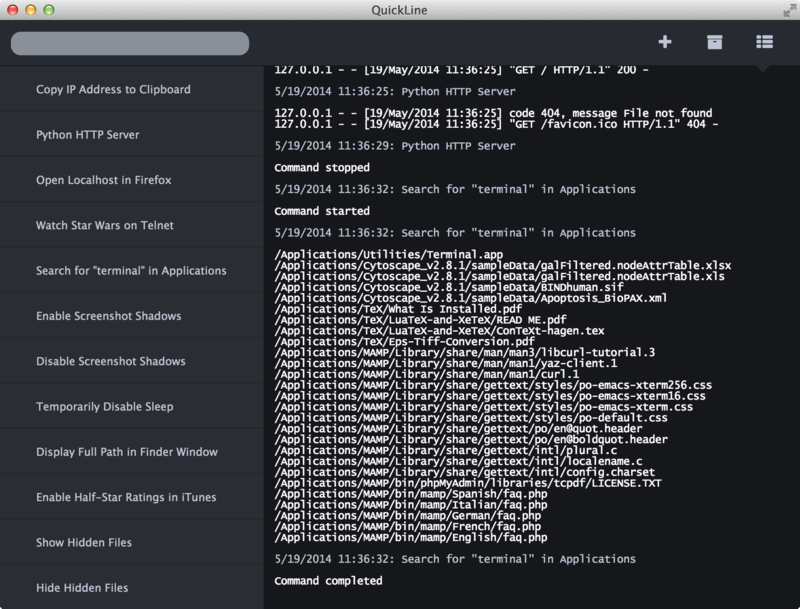 QuickLine achieves this by making terminal commands discoverable, transparent, and tweakable. 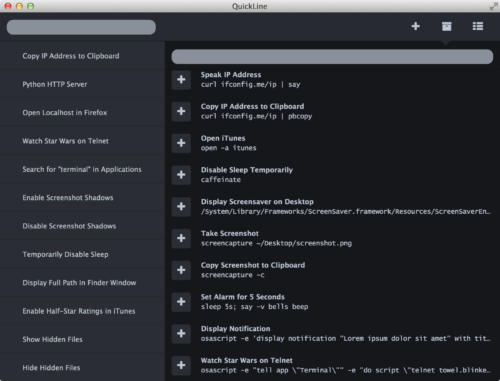 At the time I was developing QuickLine, I felt enthusiastic that it could resonate with Mac users. But that was tempered on the one hand by OS’x GateKeeper feature, which disables unsigned apps by default, and on the other hand the Mac App Store’s sandboxing requirement, which would render the app useless. I felt these were pretty significant hurdles to the very users I wanted to reach. And then I got busy with other stuff. 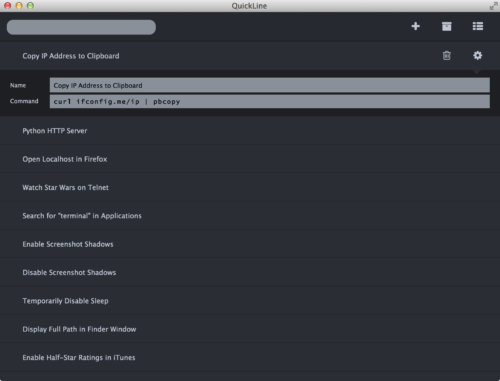 I’m releasing QuickLine now to have a record of what was a fun personal project, and to make it freely available to the few willing to seek it out. 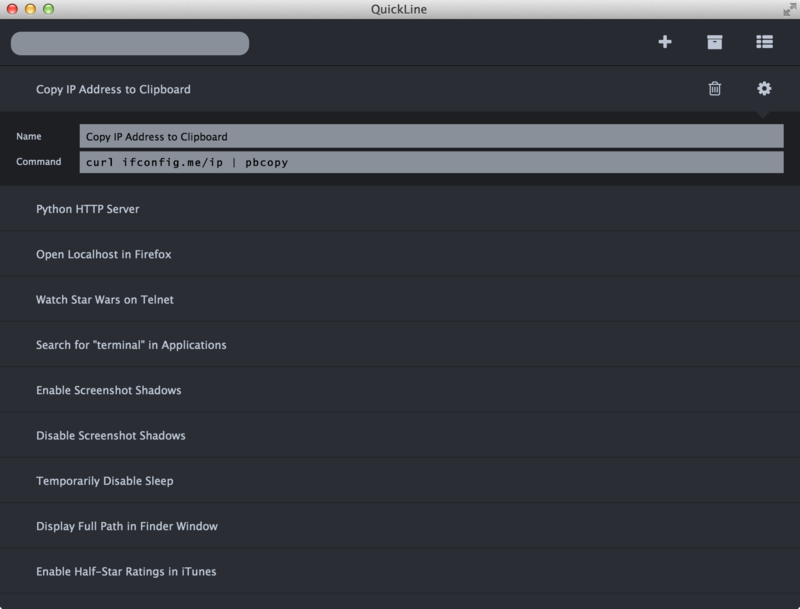 Since QuickLine isn’t signed, you’ll need to exempt it from Gatekeeper. Only trust copies downloaded from this page. Any other source is suspect. I’m making it available on an as-is basis. 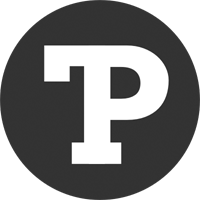 Consider it abandonware, with no support or updates planned. Finally, all the usual caveats of the command line apply. 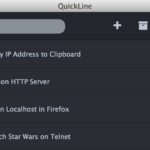 While the commands included in QuickLine have been vetted, copy and paste random commands from the internet at your own risk. Malicious commands can do serious damage to your system, so user discretion is advised. My thanks to Amy, Anthony, James, and Bernie for helping out with testing way back when.